Each month we post an annotated bibliography of books that were rated ‘Outstanding’ and nominated for our Distinguished List at our previous month’s meeting. Members can see full reviews of these books and many more in the December edition of BayViews. Not a member? Join, come to our monthly meetings, and hear about these outstanding books in person! After the Fall: How Humpty Dumpty Got Back Up Again written and illustrated by Santat, Dan; Roaring Brook, 2017. All the Way to Havana written by Engle, Margarita and illustrated by Curato, Mike; Henry Holt, 2017. Baby Goes to Market written by Atinuke and illustrated by Brooksbank, Angela; Candlewick, 2017. Blue Sky White Stars written by Naberhaus, Sarvinder and illustrated by Nelson, Kadir; Dial/Penguin Random House, 2017. Can’t Catch Me! 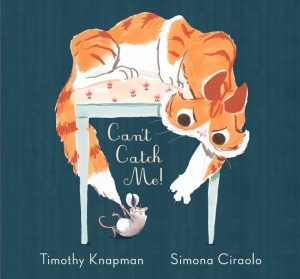 written by Knapman, Timothy and illustrated by Circaolo, Simona; Candlewick, 2017. A Christmas for Bear written by Becker, Bonny and illustrated by Denton, Kady Macdonald; Candlewick, 2017. A Greyhound, A Groundhog written by Jenkins, Emily and illustrated by Appelhans, Chris; Schwartz & Wade/Penguin Random House, 2017. The Legend of Rock Paper Scissors written by Daywalt, Drew and illustrated by Rex, Adam; Balzer + Bray/HarperCollins, 2017. Little Fox in the Forest written and illustrated by Graegin, Stephanie; Schwartz & Wade/Penguin Random House, 2017. 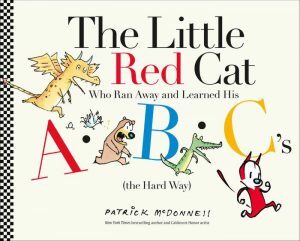 The Little Red Cat Who Ran Away and Learned His ABC’s (the Hard Way) written and illustrated by McDonnell, Patrick; Little, Brown/Hachette, 2017. Many: The Diversity of Life on Earth written by Davies, Nicola and illustrated by Sutton, Emily; Candlewick, 2017. Now written and illustrated by Portis, Antoinette; Roaring Brook, 2017. Robinson written and illustrated by Sís, Peter; Scholastic, 2017. The Tree Billy Goats Gruff written and illustrated by Pinkney, Jerry; Little, Brown/Hachette, 2017. Wolf in the Snow written and illustrated by Cordell, Matthew; Feiwel & Friends/Macmillan, 2017. Beyond the Bright Sea written by Wolk, Lauren; Dutton/Penguin Random House, 2017. A Face Like Glass written by Hardinge, Frances; Amulet/Abrams, 2017. It All Comes Down to This written by English, Karen; Clarion/Houghton Mifflin Harcourt, 2017. Little & Lion written by Colbert, Brandy; Little, Brown/Hachette, 2017. My Brigadista Year written by Paterson, Katherine; Candlewick, 2017. Piecing Me Together written by Watson, Renée; Bloomsbury, 2017. The Shanghai Incident (Master Diplexito and Mr. Scant) written and illustrated by Methods, Bryan; Carolrhoda/Lerner, 2017. The Whiz Mob and the Grenadine Kid written by Meloy, Colin and illustrated by Ellis, Carson; Balzer + Bray/HarperCollins, 2017. Wishtree written by Applegate, Katherine; Feiwel & Friends/Macmillan, 2017. Poe: Stories and Poems: A Graphic Novel Adaptation written and illustrated by Hinds, Gareth; Candlewick, 2017. Swing It, Sunny written by Holm, Jennifer L. and illustrated by Holm, Matthew; Scholastic, 2017. Let’s Clap, Jump, Sing & Shout; Dance, Spin & Turn It Out! : Games, Songs & Stories from an African American Childhood collected by McKissack, Patricia C. and illustrated by Pinkney, Brian; Schwartz & Wade/Penguin Random House, 2017. Here We Are: Feminism for the Real World edited by Jensen, Kelly; Algonquin/Workman, 2017. How to Be an Elephant: Growing Up in the African Wild written and illustrated by Roy, Katherine; David Macaulay Studio/Roaring Brook, 2017. The People Shall Continue: 40th Anniversary Special Edition / El Pueblo Seguirá: Edicion Especial 40 Aniversario written by Ortiz, Simon J. and illustrated by Graves, Sharol; Children’s Book/Lee & Low, 2017. A World of Information written by Platt, Richard and illustrated by Brown, James; Candlewick, 2017. Muddy: The Story of Blues Legend Muddy Waters written by Mahin, Michael and illustrated by Turk, Evan; Atheneum/Simon & Schuster, 2017.